It’s a fact that I can’t change the past. What’s done is done. Staying stuck, reliving old and painful situations leaves me bitter and resentful. It keeps me from enjoying the life that is happening in the here and now. It will ruin my chances of having a happy future. For way too long I have allowed myself to remain frozen in time. A time that was fueled by drugs, anger, resentments, pain, misery and suffering. I wasn’t happy and I made everyone around me unhappy too. The bitterness that I displayed was a direct result of my not being able to let go. I was angry at the world. I was miserable and wanted you to be miserable to. I held everyone around me responsible for my failure. I pointed the finger at anyone that hurt or disappointed me and blamed everyone else for the way my life turned out. I lived in self pity for years and kept reliving my past as if it were happening at that very moment. It played over and over again in my head. A non stop looping video of hurts, failures and disappointments. Living like that stopped me from enjoying life. I missed out on countless opportunities. Life just passed me by. Now it’s like waking up from a coma only to discover that 40 years has gone by. No one remembers me because I wasn’t present in the moment. I was too busy living in the past. I wasn’t a active participant in anything that mattered. Time kept moving on and I didn’t. The hardest thing I ever had to do was learning to let it go. Holding on for so long seemed like the right thing to do at the time but I have learned that no one suffers from it but me. I must let go so I can be free from the past. 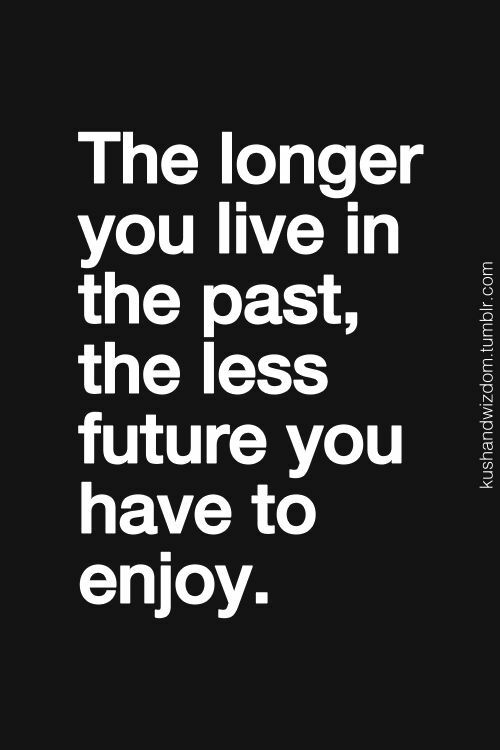 Enjoy the present and look forward to the future. This entry was posted in 2015 and tagged addiction, Let go, recovery. Bookmark the permalink. ← WHEN YOU DON’T KNOW WHAT TO DO.. DO NOTHING?? Oh boy can I relate to being stuck in the past and relieving the misery over & over in my head. I had so much anger towards others and anger at myself that led me to live in guilt daily. I’ve let go of so much. I don’t hold resentments towards anyone these days. I had to pray daily to be willing to forgive people and then I prayed to forgive people. I’m still letting go of anger and guilt towards myself. That has been on going process. Today I’m basically a happy person. I live in today for the most part. I’m still a work in progress. Amen. Thank you for sharing your identification. I am dealing with learning to let go of guilt also. Progress not perfection. Have a great evening Vicky.